By the treaty of Edinburgh the Siege of Leith came to an end. The French were to leave the country within twenty days, the Walls of Leith were to be demolished and Mary, Queen of Queen of Scots and Francis II were to remove the Coat of arms of England from their coat of arms. However, in defiance she refused to sign the treaty and earned for herself the undying hatred of Elizabeth I of England. 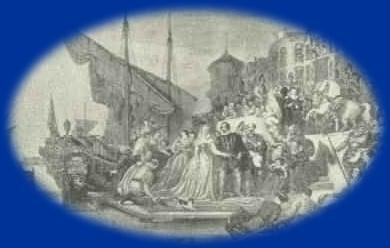 So who was Mary, Queen of Scots who after the death of Francis II on the 5th December 1560 set sail for Scotland? A country she hadn’t seen for almost thirteen years and which had changed so much in that time. This letter had the desired effect and within two years the Tolbooth was built and was demolished in 1819 and replaced with a new Tolbooth in 1822 to a lower standard. It is from the original Tolbooth that of course Tolbooth Wynd got its name. Her lasting achievement was through her son, which put a Scottish King onto the throne of England and created Great Britain on the death of Elizabeth I in 1603. Next month the return of Civil war in Scotland between the Kings men and the Queens men, battles fought between Leith and Edinburgh, and how in a way Leith won after running battles were fought over what is going to be Easter Road and Leith Walk in the future.